We may not yet have a flux capacitor for time travel, but we do already have the equivalent of "Mr. Fusion", which if cleverly applied, will enable you to run your car on everyday "trash"-- today. This "magical" device is called a gasifier. And what it does is called gasification. The resulting gas goes by the names "wood gas, "producer gas" or "syngas". Gasification is the use of heat to tranform solid biomass, or other carbonaceous solids, into a synthetic "natural gas like" flammable fuel. Through gasification, we can convert nearly any solid dry organic matter into a clean burning, carbon neutral, gaseous fuel. Whether starting with wood chips or walnut shells, construction debris or agricultural waste, the end product is a flexible gaseous fuel you can burn in your internal combustion engine, cooking stove, furnace or flamethrower. Or in this case, your DeLorean. Well ok, how about a Honda Accord . . .
Did you know that over one million vehicles in Europe ran onboard gasifiers during WWII to make fuel from wood and charcoal, as gasoline and diesel were rationed or otherwise unavailable? Long before there was biodiesel and ethanol, we actually succeeded in a large-scale, alternative fuels redeployment-- and one which curiously used only cellulosic biomass, not the oil and sugar based biofuel sources which famously compete with food. This redeployment was made possible by the gasification of waste biomass, using simple gasifiers about as complex as a traditional wood stove. These small-scale gasifiers are easily reproduced (and improved) today by DIY enthusiasts using simple hammer and wrench technology. The goal of this project is to show you how to do it - using tools you can find at Sears! Here's a video of us driving the finished Honda Accord around West Oakland - and over to Sears in downtown to pick up some more tools! Fire was kept only in the gasifier. And everyone made it home with smiles on their faces. This is a really big project! We split the project into several Instructables to make it easier to understand. This instructable explains how to retrofit a Honda Accord (or nearly any car) with our open source Gasifier Experimenter's Kit (GEK) to power it. In this project we cover modifications to the standard GEK Gasifier that are needed, details specific to its installation into the Honda, and modifications to the Honda itself. All standard GEK Gasifier construction and operation details are covered in the sub-projects below. You can also check out the home site, with updated instructions, CAD files and pictures since the Instructable below. Check the Building the GEK Instructable to learn how to fabricate the standard GEK gasifier vessels. Check the Running the GEK Instructable to learn how to start and operate the GEK to produce syngas. For more info and extra pictures about this project, see the main GEK site. Inspired? Check out our No Petroleum Allowed Road Rally, the Escape From Berkeley. We developed the open source Gasifier Experimenter's Kit as a flexible-fuel biomass processor to produce a gaseous fuel (syngas). The syngas produced by our GEK can be used to power generators, heaters and motors (nearly anything that could be run on propane), so we decided to build a concept car powered by our GEK unit. In a normal car, liquid gasoline is injected into the cylinders while air is sucked in to burn it. The GEK produces a syngas fuel not a liquid - similar to natural gas. So we can't just dump it into the gas tank and run the engine as usual. What we'll do is to disable the Honda's gasoline fuel injectors and route our syngas in through the engine's air intake. We'll install a somewhat modified version of our standard GEK unit into the trunk area, with a fuel tube going up to the Honda engine in front. The only modification to the Honda engine is that we disable the fuel injectors, and tee the air intake to allow pulling in our syngas along with the air. In fact, the Honda engine still can be run on gasoline when we are finished - all that's needed is to flip a switch to re-enable the fuel injectors. Easier said than done! Read on to see how to do it . . . maybe . . . The vehicle was built at the ALL Power Labs shop. We've got a lot of fun tools, but you could build this project with just power tools you'd find at Sears. I'll note what your alternatives are below. Power tools - we used all of 'em! drill, grinder, reciprocating saw, flashlight, belt sander, circular saw, etc. Socket set, wrench set, vice grips, etc. MIG welder, plasma cutter (hand and CNC). All you really need is MIG and a cutting torch, the rest of it was us just getting fancy. You could also use a reciprocating saw with metal cutting blade instead of a cutting torch, although that would take a bit longer. Sheet metal cutters, benders, rollers. This is because we fabricated entirely from sheet steel. To avoid the bending and rolling the easy thing is to start with a recycled metal tank as described in step 5. Car jack. We've got the fancy garage type lifter, but any car jack will do. The complete GEK Gasifier is designed so that it can be constructed from the lowest cost and most commonly available parts. It is nearly all common sheet steel and plumbing parts. The Honda conversion also does not use any expensive or hard to find components - total raw material and parts cost for this project is probably about $1000 if you build everything yourself. Our GEK Gasifier kit. We supply CAD files so you can fabricate totally from scratch, or you can purchase parts kits from us at various stages of assembly. Fabrication and/or assembly of the GEK using our plans or kits is detailed in our Instructables Series. There are a lot of potential dangers with this project. We recommend you always have a responsible adult present when building your Trash Powered Honda. Cars are big! Heavy! And have lots of moving parts that can squash or grind you up! So dont be an idiot. Don't smoke. And certainly don't smoke the equivalent of 100 cigarettes simultaneously by breathing in any leaking gas from your GEK. Always use a gasifier outdoors, and with extensive ventilation. Always stay out of the smoke and/or produced gas before it is combusted. Know that this is NOT typical campfire smoke. Do NOT treat it as if it were. The carbon monoxide concentrations in gasifier gas are higher than in other "smokes". You can get in trouble quickly, usually before you realize it. SO STAY OUT OF GASIFIER GAS AT ALL TIMES. And remember that with just one extra oxygen, CO becomes CO2. It is a very easy oxidation pathway, thus why syngas burns so cleanly. Anyone have a Prius we can challenge at the smog shop? See here for basic information on wood gas and biomass gasification. The GEK Imbert reactor standard sizing and configuration is known to produce clean syngas when operated by a knowledgeable enthusiast. This default configuration will run 5-20hp engines. We've expanded the internal sizes for the Honda Accord project so it can support the 70HP or so Honda engine. The GEK building scenario let's you decide the relative amount of "effort vs cost" you want to invest towards your finished unit. The basic vessel dimensions are based on common scrap tanks found in North America, so you can choose to build it for minimum money with the dimensions, instructions and CAD files provided here. The local junkyard will give you all the greasy obtainium scrap tanks you need. Or you can build the GEK from clean and purpose cut sheetmetal, also using the CAD files provided here. The more elegant way to build the GEK is from purposed cut and rolled sheetmetal. Sheet metal is still very inexpensive, and you will have better dimensional control than via the obtainium route. You can cut the sheetmetal to make the vessel tubes, flanges and end plates, using a gas torch or plasma cutter. Potentially even a sawzall, but ugh! Ideally, the tool for the task is CNC plasma cutter, which can run off the CAD files provided here. Many "manufacturing on demand" providers offer cnc plasma cutting services, so you could order in perfectly cut sheet metal to get you started, and not spend all your enthusiasm fighting the prep work. ALL Power Labs can also provide readymade sheet metal and plumbing kits. See here for more information about readymade GEK wood gas kits. Hopefully one of the above scenarios will find a good match with your abilities, time and money available. Whichever route you choose to build the GEK, the final unit is the same, and thus experiments and customizations are easily sharable across the GEK user community. The standard GEK gasifier system consists of the following seven components. For the Honda GEK we made a few slight changes to the standard GEK design which are noted below (and detailed in later steps here). We will be building each of these components separately in a "slight detour Instructable" dedicated to the welding project. After we're finished, we'll return right here to consider the final assembly and preparation for the first test run. And now, get you MIG welders ready, its time to fabricate your GEK . . .
With basic GEK welding complete, now we can assemble and prepare for fire. No Honda is required for this. When you are finished assembling your basic (or modified) GEK, it will look like one of these. For the standard GEK: the gas cowling, reactor and hopper bolt together into a single vertical assembly. The cyclone, packed bed filter and blower similarly bolt together into a single vertical assembly. These two assemblies attach together via the gas outlet flange to the cyclone. A soft hose attaches the blower to the swirl burner. And then, fire! The details of how to accomplish this require another "slight Instructable detour", though we promise not to send you through the ringers of previous. You're now through the hard part. It's all downhill coasting from here to 88MPH. Click here for the GEK final assembly and first firing preparation instructable. With the GEK now together, we hooked it up to a prototype of our electronic Reactor Control Unit (described later) and ran the output to a 2kw 4-stroke generator. This was to simulate more or less what we were planning for the Honda. Somewhat surprisingly, it worked! Here's the separate Instructible for how to start and run a GEK design gasifierstart and run a GEK design gasifier. The trunk of the Honda seemed like a good spot to put the GEK! 3) Fabricate 2 heavy duty mounting pins. The mount system allows rotating the mounted GEK for access, then pinning in place during driving. When we started out, we were going to get a bit fancy and have a hopper alongside the GEK to hold the fuel. This would be great because the GEK heat would help dry the fuel in the hopper, and the form factor would be more compact. Unfortunately - the alongside hopper requires an auger to move the fuel up and over into the GEK reactor, and this auger proved to be a difficult piece of engineering. So you'll see parts of the hopper with auger bits in them, but ultimately we have not yet gotten the auger fully functioning, and it is not needed with a much simpler over-head hopper. The hopper box frame is sized to hold the GEK, and to fit into the trunk opening in the honda. We started with the standard GEK cyclone, and fitted it into the hopper/box as well. In the photos here we also dropped the box into the car. Actually to be more accurate, we dropped the car onto the box using a car jack, the box just sat in place. - At the bottom of the GEK cowling is the standard GEK ash grate for holding up the fuel in the gas producing reduction zone, and allowing ash to filter out the catch basin. In a standard GEK the grate has an external bar for turning by hand. - We connected the grate drive shaft to a windshield wiper motor mounted to the bottom of the box, so that it can be turned automatically. We call it the JIGGLERATOR. although we do love its name, testing of the vehicle showed that at least in city driving, the car bumps around enough by itself to unclog any fuel jams. - Also on the bottom are dump ports for ash and water condensate from the output syngas. The syngas and air are both going into the Honda engine via the original air intake. That means the Honda engine can no longer control its own fuel/air mix. We built a new air intake with a butterfly valve so that we can control the fuel to air mix ratio. The fuel to air mix needs adjustment while the car is driving, so we added a servo control which can be operated from the driver seat. - The new airtake starts with a length of 2" diameter PVC pipe. - The butterfly valve is a fender washer that matched the ID of the pipe. - The servo turns the rod to open and close the valve. - The syngas is routed to the back of the car - using flexible tubes in front and in the rear, underneath the car we made a rectangular steel tube for strength. See photo notes. - Our custom servo controlled butterfly valve is installed as the new air intake. The valve lets us control the fuel to air mix now that both are going into the original air intake. We built several solid fuel augers, but soon discovered that it is a difficult engineering problem when you want to run an auger up from horizontal, or in our case, about 45 degrees. We currently run the vehicle with the typical top-mounted gravity-fed GEK hopper, which is simple and reliable. We hope to get the auger working eventually but for now you can refer to our prototypes and hopefully learn something about all the ways that auger can not work. We built and tested 2 different auger designs. Generally, they would work for certain fuel size and shape, but when the particulars changed, they would either jam or fail to move/lift the fuel. The GEK reactor will run on a wide range of solid biomass as long as it is chipped or chopped into chunky bits from about 3/8" to 1.5". All diagnoal designs we tested were much more fuel sensitive than the gasifier itself. - Added instrumentation - 4 thermocouples and 2 pressure sensors. These aren't really needed for operation, but we built this as a research design so we like to know what is going on inside. See the photos for how we routed the thermocouples into the GEK so that they are durable and don't interfere with operation. 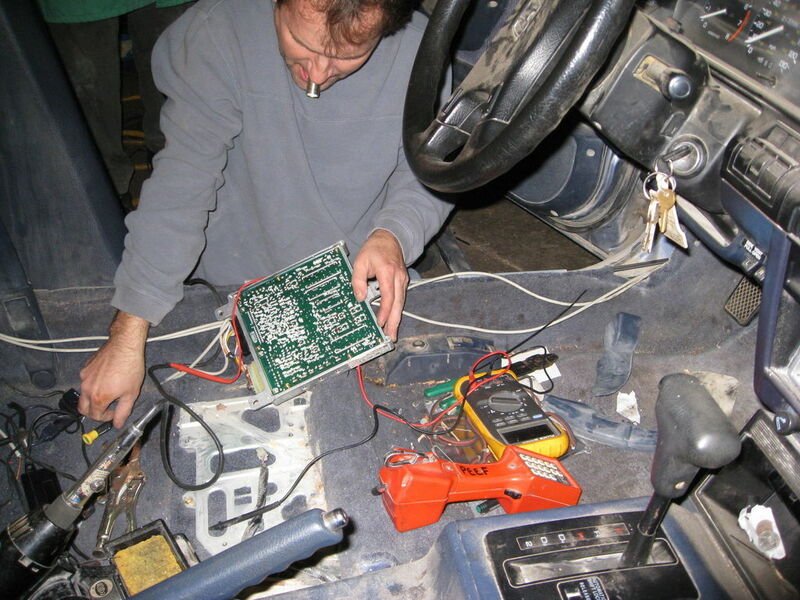 Any modern car has an Electronic Control Unit, or ECU, which monitors and controls the engine function and keeps everything working. It is often called the Brain of the car. One of the Honda ECU's main functions is to properly inject gasoline into the engine, and monitor the fuel/air mix. Since we are doing some Serious Monkeying Around with both of those pathways in order to replace the gasoline with our Gasifier produced syngas, we built our own Reactor Control Unit (RCU) - also known as THE BRAIN 2. - Sense if the fuel mix is lean or rich. We use the existing oxygen sensor from the Honda and access it where it connects to the Honda ECU (Honda's stock ECU is their brain for running the car). - Control our new fuel/air mix butterfly valve. We drive a servo from a dial mounted on the dash. We also have a switch on the dash that can toggle between Manual fuel/air mix control, and Automatic fuel/air mix control. In Auto mode our RCU uses a closed-loop feedback to automatically adjust the air/fuel mix, just like the Honda ECU does when running on gasoline. - A sensing and control loop for steam injection into the gasifier, when there is adequate heat. The GEK in the this Honda has a variety of heat recycling systems which result in a surplus of heat in the gasifier, heat which can be usefully consumed via more steam over the glowing char in the reactor, and thus a more hydrogen rich gas output. - A solid fuel level sensor and auger motor control. Not used in the current non-auger design. - A USB connection to a laptop, we send all the sensor data to the laptop to display it. The Co-pilot can check the readings on all the instrumentation - thermocouples, pressure sensors, oxygen sensor, and all the motors can be activated manually by the copilot. - A switch to disable or enable the electronic fuel injection. we again tapped into the Honda ECU for this. The air/fuel mix knob and manual/auto switch are just next to the wheel for the driver. The Copilot can watch all the sensors via the laptop display, and make changes to any of the motors or the air/fuel mix as well. The laptop also logs the readings so we can see what worked and what didn't. - Bolt hopper on top of reactor. We made a thinner hopper than the standard one so so it fits behind the rear window. When starting up the GEK reactor its convenient to be able to get it going without having the Honda engine running. We put a tee on the GEK syngas output so we can send it either to the engine or to cyclone burner flare-off. Once the reactor is up to temperature and running well, we can shut off the cyclone and start the car on syngas. Step 21: Load Solid Fuel and Ignition! Hey man, can i borrow your shoes? No? Well, how about some wood chips? Or those peanut shells you are throwing everywhere? Step 23: GO! 88MPH Here We Come . . . Here's a video of us driving the finished Honda Accord around West Oakland. No shots were fired. Fire was kept only in the gasifier. And everyone made it home with smiles on their faces. If you like our Mr Fusion, please remember to vote for us in the Craftsman Workshop of the Future contest. Vote now using the "vote now" button at the top. Maybe we can win back half the tools we lost making this . . .
We tested the auger-based design once, here are the fully assembled photos. These include an optional system to eject the co-pilot out the sunroof, through a feed tube and into the hopper. This instructable explains how to retrofit a Honda Accord (or nearly any car) with our Open Source Gasifier Experimenter's Kit (GEK) to power it. In this project we cover modifications to the standard GEK Gasifier that are needed, details specific to its installation into the Honda, and modifications to the Honda itself. All standard GEK Gasifier construction and operation details are covered in the sub-projects below. How much CO2 is released and soot compared to gasoline? It a brillant Instructable. What kind of speed can you get the Honda up to? Is it a highway drive-able or strictly around town vehicle? Great work.Very interesting and informative project. You've described each point very clearly. Thanks for the post. here in Bangladesh most vehicles use CNG or compressed natural gas i think. My only reason for commenting here is that this Syngas idea leads me back to my idea of simply letting biomass to rot in a big sealed bin to create gas. Simply fill that gas into your vehicle and it will burn and churn the combustion engine. I'm no expert but this kind of tech is used in India as cow dung is dumped into such a huge sealed bin and that gas is used for cooking....and by cooking i mean that gas acutally burns. So Jim hope you make that and you might actually keep driving your car quietly without anyone even knowing. Oh another thing your honda accord wont be that noisy with any kind of gas as fuel. very nice work.Thanks for sharing and affording guidance. My grandpa always told us about how they used that in Germany during and after the war. He would've loved to see something like this. you should put this on a delorean with a flux capacitor and a time circuit. Fantastic 'ible!!! What are some good ways of determining how big the gasifier needs to be to run certain engines, so that I can build one to fit in my car with the least amount of mods. Also, what is the most efficient temperature to run a gasifier. Thanks! I think what you need is TWO screws, turning against each other (that is, a left-hand screw and a right-hand screw, both moving the material up, and turning in opposite directions). Am I crazy? two flat rubber belts on a funnel shaped form would do the job pretty well. like back to the future car use garbage. Great idea man keep it up. "the file is damaged, and cannot be repaired......."
Would something like this be doable for a motorcycle? This is really cool and everything, and it's a great example, but does anyone else think it's a little pie-in-the-sky for large distribution due to the enormously costly electronic control system? If only someone could come up with a more elegant mechanical control system design, it would reduce the cost by, what? Two thirds? Three quarters? I doubt it. There is a reason why electronic controls are replacing mechanical ones in homes, cars, industrial devices, really about everything. The electronics may look expensive, but if you tried to do anything similar with mechanical control, I would bet that it would be more expensive. That would be true in one-off (because of the time required to machine the mechanical parts for a custom mechanical control) or mega-scale (because if Honda decided to produce a wood-gasifier car, the control would not cost any more than the ECU that runs the gasoline engine). I suspect that it seems expensive because you are unconsciously comparing a one-off scale research setup to the prices of mass produced products.